Mr. G's musings: RACHEL MADDOW is a goddess! She is truly the best thing in the news and on television. She is intelligent, articulate, humorous and gracious. She is the hope for this country's future. She is the voice of freedom. She recently took a holiday for a week or two. She has returned better than ever. Forbes says: Rachel Maddow Is Now The Most Powerful Person In Cable. 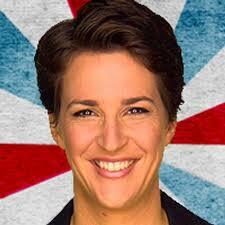 Thanks to Maddow's brilliance, MSNBC is now the most-watched news. People have caught on to the lies of Fox news and CNN who seems to do anything it can to outdo Fox. Fie on them both. MSNBC is the only television news for me. I nominate Rachel Maddow for president in 2020! She is my oasis in a the worst desert. Also glad that MSNBC has retained Lawrence O'Donnell. I love Rachel also! I remember first hearing her on the radio, just when she was transitioning to MSNBC, which I also like. Lawrence, not so much.